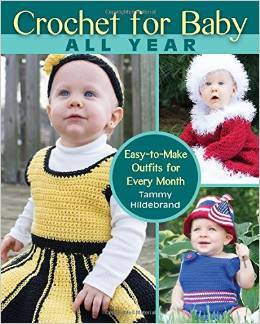 Win a copy of Tammy Hildebrand’s Crochet for Baby All Year: Easy-to-Make Outfits for Every Month. There’s still time to enter to win Tammy Hildebrand’s Crochet for Baby All Year: Easy-to-Make Outfits for Every Month. You have until Noon EST today! Just check out my previous blog post HERE to find out how to enter. This entry was posted in Crochet and tagged Crochet for Baby All Year: Easy-to-Make Outfits for Every Month, Tammy Hildebrand.